Ford Bronco Forum > Bronco Discussions > 1980-'96 Bronco Tech > my 4-bolt steering box swap... yes, you can reuse your existing hoses. the only advantage i know of is that the 4-bolt box is a better design that is less likely to wear out with lots of use vs the redhead's 2-bolt. sure, they come from redhead without any slop but eventually they will wear out the same as an original motorcraft box. this is mainly a concern if you drive your bronco a lot. also, the 4-bolt box can be cheaper. i got mine out of a junkyard, but you could just as easily buy a parts house reman 4-bolt box for much cheaper than a redhead 2-bolt box. now, im not saying that the 4-bolt box will never develop slop. im just saying that for me, it was worth it to swap to a $30 junkyard 4-bolt box rather than saving up for several months and missing several months of wheeling to get a redhead box. i still have some steering slop, but i think it is due to the steering shaft. at any rate, the 4-bolt box cut the slop about in half, and it is now manageable. dash_cam, CainsBigRed, I6-Kid and 1 others like this. i used photobucket to embed images here. since they screwed me and quit hosting 3rd party images without warning i have tried to fix all MY broken links on the site here. if you notice any of MY posts with a broken link or missing image, please PM me with a link to the thread and i will fix it. Wow I'm very late to the party HAHAHA so far all I have to say about the 4 bolt is that IT WORKS as ShaprShooter mention the slop is cut drastically, I did end up getting the gear box with the wrong spilne count but on ebay I bought a new drop pitman for the same year excusion and it bolted up to the super runner steering no problem. it would of been a $120 upgraded with all parts for me but since I did have to buy a drop pitman that took me $70 more than expected. Did anyone using the brass seat inserts get the factory hoses to seal properly? OP said his eventually leaked right? yes, with mine the factory return line/cooler leaked. the pressure hose is still sealing good (knock on wood). i am not sure if you can get the factory return line to seal properly. if i were to try it again i would unbolt the cooler from the cross member then tighten it down. this way it could seat properly and get all the way tightened down, then you could just bend it to the proper shape to get it to bolt back to the cross member. but honestly, in my opinion, its not a whole lot of extra work to get the 4-bolt box return line and figure out some way to get it back to the steering pump. you dont have to do the e-van cooler, you could run rubber hose straight from the 4-bolt return line to the return fitting on the power steering pump for now. maybe someone else has had a different experience than i did with the factory return line/cooler. Thanks sharpshooter I was hoping you would chime in. The main reason I'm not wanting to mess with the cooler right now is that I'm planning on getting a 4 bolt read head box. Probably overkill but I've wasted so much money on cheap steering parts on this truck that I'm not going to take any chances this time. Short of a SAS I want the very best steering parts money can buy this time around. I'm a bit biased, and maybe it's a sample size thing, but I feel like I've seen more reports of red head box problems than for OEM 4-bolt boxes. '92 Bronco Build Thread - '95 MAF 5.0, H5 axle code, York OBA. I wonder if there are any significant improvements in the 36 spline 4 bolt over the 32 spline 4 bolt. The 36 does say its for vehicles with over 4200 lbs front axle weight so I would guess its a little stronger somehow. Rockauto shows that you can get NEW, not rebuilt or remanufactured boxes in the 36 spline for about 360 bucks. If there are improvements and the 36 spline Excursion pitman arm works with the stock inverted Y steering that might be something useful. Not sure about the 36 spline box but as far as the return setup, I think you can buy the return line for a 4 bolt box at the parts stores. It’s just the metal line with the fitting and a rubber hose built into the other end. You might need a barb fitting and some more hose but you could make it go back to the return fitting on the pump without the e-van cooler. That would probably be my preferred way to go if I were in your shoes. You could cut off the stock “cooler” near the fitting and attach a rubber hose to the end. 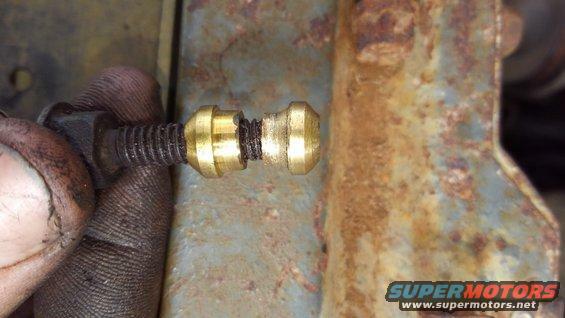 Use the brass fitting to make it seal and it SHOULD work. I haven’t tried it though. I don’t mean to discourage you from using the stock cooler as is, I just wish I had put forth the effort the first time so I didn’t have to go back and fix it when it leaked (which was almost immediately after I swapped over to the 4-bolt box). The Excursion came with a few different offset for the pitman arm from what I read when i was looking into the upgrade (zero offset, 15 degrees and 25. I will need to look it up to confirm), I should still have the arms somewhere at home, if i remember correctly the factory excursion arm had a light drop about 1 to 1.5 inch but it was not enough for a lifted bronco, might still work for you though. I take some pictures to night as it might still help out others. i have a 32 spline 4-bolt in my 96 bronco and my 90 F250. i have a 36-spline in my 88 bronco and ordered a 36 spline drop pitman arm for it. generally the higher spline count is stronger slightly stronger. we recently did the 4-bolt swap in @WhoisScubaSteve bronco few weeks ago. i again ground the seals till it fit. it worked for a couple weeks but then the return also started to leak. i ordered a few pairs of the Lees seals and we jsut installed one in his bronco this weekend. hopefully it will hold good. i will say that the Lees seals i got were a pretty loose fitting, dont need the install tool but it makes it alittle easier if you have it. I installed a 4 bolt from an 97 F250 today. Went well. Working on my high pressure hose now. Has anyone tried cutting off the flare end of the stock hose and having a crimp end put on at a shop? Anyone tried cutting of the gear side flare end of the stock hose and having an o ring crimp put on it? Bronco Info: 1996 EB, 351w, stock-ish. 1981 custom 351m, long gone. I had a custom pressure hose made but had the return hose changed . I would suggest an AN for the end and then an AN fitting for the gear. Let me find the link to what I did..
@dash_cam I’m running the stock pump so in need the type one pump end fitting and an o-ring gear fitting (I assume thats an AN). I swap in a sag pump but believe finding the bracket is next to impossible now. Need bracket from an early 80’s E series I believe. This is an AN fitting. They will convert any type plug to a common connector. Then you can use universal hoses to connect your mismatched parts. In the thread I posted, someone gave part numbers for different AN fittings that they used to do just that. I'm not trying to convince you to get a sag pump but @GetBent4x4 might be able to help you out. That guy is a JY savant and might even have what you need already. my 4-bolt steering box swap... yes, you can reuse your existing hoses. What say you @GetBent4x4 any of those brackets kicking around that you need out of your way? If I stay with stock pump for now couldn’t I just put one of the in the steering gear HP side then cut of the flare end on the stock hose and reflare it with a female nut to fit that AN fitting? So I found these on Summit. I believe the 4 bolt gear is 18mm. This will get me to 11/16 inverted flare. Then I just need to get from 11/16 down to the 5/16 on the stock Bronco line. Any ideas on the best way to do that? Looking for a bushing etc to step down.